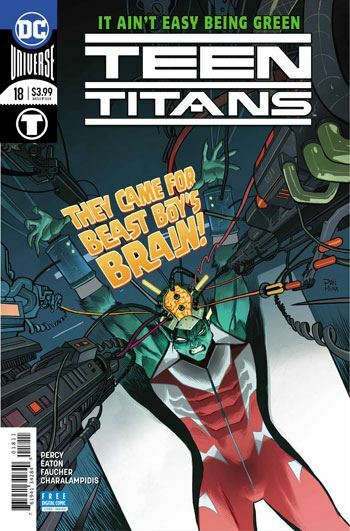 Beast Boy remains in focus in the latest issue of Teen Titans. This is a well-crafted story, with Gar Logan both being manipulated, and also willingly helping the kids behind the Nevrland group, and Pixie. The group is out to take control of the minds of outcasts and rejects. Gar is such a solid believer in the goals of the group, to provide a safe and friendly place for these kids, that he makes good suggestions on how to reach out to them. Perhaps because he is listened to, Gar trusts the group so much that he allows himself to be used as living promotion for the Pixie implant. This is marketed as a way to experience the worlds of video games, comics and such, to a greater degree, but is also fairly obviously a method of mind control. The rest of the team have a much smaller role in this issue, amid the semi-wreckage of the Titans Tower. Damian does the detective work that gets the team onto the trail of the Nevrland group, and they show up in time to try to talk some sense into Logan. Too late, as it turns out. Eaton and Faucher do very good work on the art throughout this issue. There is plenty of strong detail on the faces and expressions, and the story moves gracefully from fantasy scenes to realistic ones. 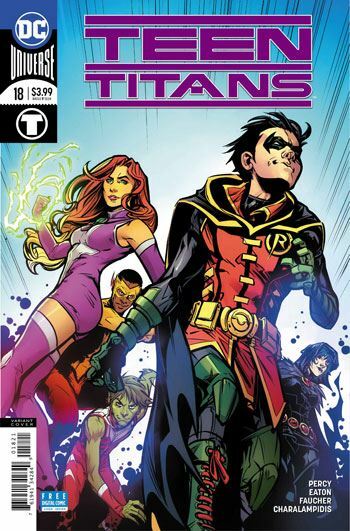 A very good story, and as Beast Boy is one of my favourite Titans, one I highly enjoyed.